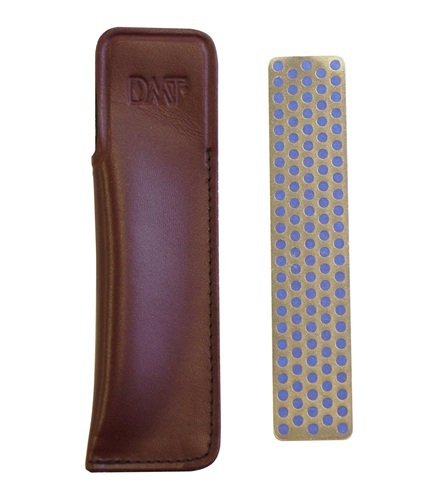 DMT Whetstone Sharpener 0.875 x 4.5 x 3/16 inch. 4" Diamond Whetstone sharpener is a convenient pocket model. Comes with a protective leather sheath for easy access to a variety of sharpening honing or filing needs. Stone measures 4-1/2" x 7/8" x 3/16". -Extra-Extra Coarse diamond (120 micron / 120 mesh) for extreme removal of material and edge repair. -Extra-Coarse diamond (60 micron / 220) when significant removal of material is needed for a damaged edge. -Extra-Extra Fine (3 micron / 8000 mesh) provides the finest polished edge of all bonded diamond abrasives. Sharpening with diamonds is fast and easy. No messy oils needed simply sharpen dry or with water. Durable construction will provide years of consistent performance and reliable service. For proper tool maintenance woodworkers chefs and other professionals rely on the superior quality and versatility of DMT products. Made in USA.